So you fancy buying a litre-class, fully faired sports bike, but are worried about the fatigue that the aggressive, forward biased riding posture gives? Well, Ducati and Kawasaki make street friendly big sports bikes as well. Here is how they compare spec wise. Ducati has just launched its SuperSport series in India, which aims to be the more street friendly alternative to the track-focused Panigale series. 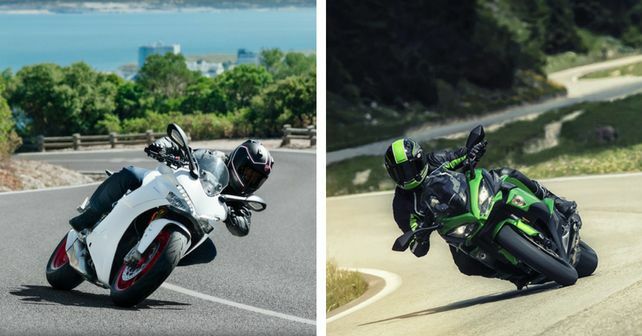 The SuperSport is available in two avatars - SuperSport and SuperSport S, with the major difference between the two being the latter getting a superior suspension setup. Like most Ducatis in India, the SuperSport lives in a territory of its own, with no direct competition. However, the Kawasaki Ninja 1000 aims at more or less the same audience as the Ducati. Plus, it boasts two additional cylinders and more horsepower, at a very competitive pricing. Both of these are contemporary sportsbikes. The SuperSport has been revealed in 2017, while the the Ninja 1000, though not all new, has been thoroughly refreshed for 2017. The Ducati SuperSport and SuperSport S look exactly the same aesthetically. The Panigale inspired design is unmistakably Ducati, as the unique LED DRLs sitting on top of the headlamps grant a striking stance to the SuperSport. Compared to the Kawasaki, it is a compact motorcycle overall, and has less bulk to it as well. Also, Supersport’s saddle height is 5mm lower than the Ninja’s. After its facelift, the Ninja 1000 has got an all new instrument cluster and a revised fairing design. The overall footprint of the motorcycle remains the same as the pre facelift model however, which basically means it is a faired version of Kawasaki’s Z1000. It is the heavier motorcycle of the two, with more focus on long tours as compared to Ducati. What powers these two motorcycles is what differentiates them quite a lot. The Ducati SuperSport series draws its power from a 937cc, Testastretta 11 twin cylinder engine that also powers the Italian company’s Hypermotard 939 and Multistrada 950 models. The Ninja 1000, on the other hand, completely overshadows the the Ducati when it comes to power. It has two additional cylinders to begin with, and the horsepower advantage is around 30bhp. However, as previously stated, the Ninja weighs more. Both the bikes have a 6-speed gearbox, and come equipped with a slipper clutch as well. The Ducati features three riding modes - Urban, Touring and Sport, whereas the Kawasaki sports two riding modes - Full Power and Low Power, with the latter limiting the power transmission to 70 per cent. The Ducati sports dual 320mm semi-floating discs with 4-piston calipers up front, and single 245mm discs with 2-piston calipers at the rear. The Kawasaki, in comparison, has dual semi-floating 300mm petal discs with 4-piston calipers up front and a single 250mm petal disc with single piston caliper at rear. Both the motorcycles come with standard dual channel ABS and traction control as standard. Both the motorcycles ride on 17-inch tyres, but the Kawasaki sports a fatter rear tyre. The Ninja 1000’s pricing in India is its trump card. At Rs. 9.98 lakh, it is the most affordable litre-class sport bike in the country. Kawasaki has achieved such aggressive pricing by bringing in the big Ninja via the Semi Knocked Down route, which saves quite a bit on taxes and duties. Ducati, in contrast, does not assemble any of its motorcycles in India. As a result, both SuperSport and SuperSport S are brought here as CBUs, and therefore priced on the higher side. The former costs Rs. 12.08 lakh, while the latter will set you back by Rs. 13.39 lakh - all prices ex-showroom, pan-India.